It is wise to reflect on the assumptions spoken and written regarding the refusal of the Taoiseach to debate the issues. Three outcomes were possible. Firstly, the debate may have had no effect on the voters. Or the outcome may have moved an unknown number of voters to either side. Remember Nixon beat Kennedy on the radio but not on TV. Plus change! WHAT is the point of the Seanad? What does the second chamber add to our system of parliamentary democracy? These questions have been asked many times since the current Seanad was set up in 1937. Yes, there are and have been some excellent individuals who have served in the Seanad, but as an institution it has never been able to justify its existence. That is why on October 4, I will be asking people to support the proposal to abolish the Seanad. Most countries of Ireland’s size and composition work perfectly well with one chamber that is directly elected by the people. New Zealand abolished its second chamber in 1950, Denmark in 1953 and both have remained effectively functioning democracies ever since. Countries with two chambers tend to have large populations, a federal structure or are deeply divided along ethnic or religious grounds. None of that applies in Ireland’s case. The Seanad has never been the ‘watchdog’ of the Government. Just twice (in 1959 and 1964) has it delayed a bill that the Dáil then simply proceeded with. It has never even used a number of its powers. Indeed, most amendments to legislation initiated in the Seanad have been Government amendments. Under our constitution, it is most properly the Dail’s role as the chamber that is directly elected by the people of Ireland to hold the Government to account. The Government’s current comprehensive programme of political and constitutional reform will ensure that this function is strengthened even further. The Seanad’s electoral process is also bizarre and outdated. Nearly 97 per cent of the Irish population are not eligible to vote for the Seanad. The 3.3 per cent who can vote are comprised of professional politicians and graduates of the National University of Ireland and Trinity College, Dublin. And only 1.1 per cent of the population actually voted to elect the current crop of Senators. Think of all the senior citizens in this State, for example, who are not politicians or NUI/TCD graduates. These citizens have worked all their lives, paid taxes, raised families and supported their communities but have never been able to cast their vote to elect a single Senator. Some people have asked why not reform instead of abolish. But there have never been any credible and workable reform proposals that would give the Seanad a distinct and necessary role in our parliamentary system. In fact, there have been 10 reports on Seanad reform since 1937 which have all been left gathering dust. It has proved over the decades to be an undemocratic, irrelevant and fundamentally unreformable ins­ti­­tu­tion. In the wake of the disastrous economic crisis, every institution of the State must have hard questions asked of it. The Seanad has simply been unable to answer any of these questions or justify its role in any way. Labour believes a one chamber parliament directly elected by all of the people of Ireland is sufficient to meet the needs of a modern parliamentary democracy and that it is more than time to abolish the Seanad. THE attempt by the Government to abolish the Seanad is a clever ploy to avoid responsibility for the generality of Irish citizens who live outside the immediate 26 county jurisdiction. A true democracy respects and values the participation of all of its citizens. Yet in reducing the number of TDs from 166 to 158 and eliminating the Seanad, the talent pool in the Oireachtas will be stretched even further. That will mean even more “advisors” and party hacks on the State payroll to cover the shortfall in expertise among the political class. Irish citizens north of the border and abroad will be entirely ignored as participants in the direction taken by the Irish State. At present, postal votes are used to elect University senators and the electorate may live anywhere in the world. So there is a ready template to reflect the broad swathe of Irish citizenry through reform of the Seanad. Holding the services to the Irish people to account is not a noticeable feature of the whipped cowed TDs of Dáil Eireann. Over 50 per cent of Dáil legislation is abruptly terminated by the party whips. It’s called a guillotine and it operates to block examination of bills. There are rafts of European regulations and laws that have to be overseen by parliament and there is no chance of any detailed examination if there are insufficient numbers present with no Senate. The Government’s finance claim of e20 million saved has been blown out of the water. This claim that the Seanad is undemocratic is also spurious. The public elects councillors and TDs. These elect most members of the Seanad and so the election is proxy democracy. TDs are elected to the Dáil and they elect the Taoiseach. The people do so again by proxy. There are six university senators elected by thousands of graduates. The Government has been too incompetent to pass a law to give effect to widening the third level franchise as passed in a previous referendum. It is arrogance on an industrial scale that the Government offer the people a referendum and not a preferendum on this issue. Because there is no choice for reform offered this time, it is better to keep what we have and force them into reform. Irish citizens in the north and abroad deserve our respect and support. Say No to the Government. Dublin City Councillor Professor Bill Tormey said there was never a vote in Fine Gael on abolishing the Seanad and is calling for a No vote next month. A FINE GAEL councillor in north Dublin has openly defied his party’s position by erecting posters calling for a No vote in the Seanad abolition referendum next month. Professor Bill Tormey, a councillor for the Ballymun Finglas area, erected the posters yesterday in the Glasnevin, Drumcondra and Finglas areas of north Dublin on the same day that Fine Gael launched its campaign for a Yes vote. The posters refer to him as ‘Cllr. 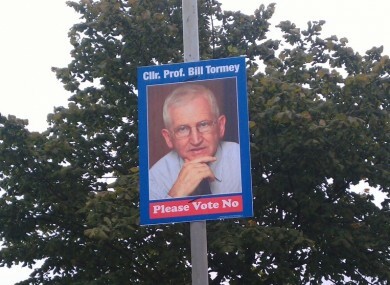 Prof. Bill Tormey’ and urge voters to ‘Please Vote No’ but do not state in which referendum with two being held on 4 October. Speaking to TheJournal.ie, Tormey said that there was a never a vote within the party on the decision to abolish the Seanad and said he is in favour of reforming the upper house. “It was decided centrally,” he said of the party’s decision to abolish the upper house – first announced at the Fine Gael presidential dinner in 2009. Noel Rock, a Fine Gael candidate for the local elections in the area, criticised Tormey, saying: “It’s disappointing: he doesn’t even make it clear which referendum he’s opposing. Fine Gael said it is policy not to comment on internal party matters and added it would not be in a position to comment until it has spoken to Tormey. Tormey also criticised the party’s arguments for abolition saying the claim that one per cent of the population elects the Seanad is “absolutely absurd”. He explained: “The Taoiseach is elected by 166 TDs, a witheringly small number of individuals in the country. Tormey also disagreed with the Yes campaign argument that other countries of a similar size to Ireland have only one parliamentary chamber. “I am Irish, I am not a Dane, I am not a Swede,” he said. He confirmed that he did not use party funds to produce the posters, saying he paid for them himself but declined to say how many he has put up. Tormey, a specialist in chemical pathology and general internal medicine, has been a Fine Gael councillor since 2004 and unsuccessfully contested the last two general elections in Dublin North West. He also failed to get elected to the Seanad in 2011. Like politics? Then why not ‘Like’ TheJournal.ie Politics on Facebook to keep up to date with all that’s happening in and outside of Leinster House. Please find a briefing note on the Referendum attached. The Party launched its poster campaign at the weekend. Personalised leaflets for councillors should be ordered through your Regional Organiser. Reply- Accountability, competence and secrecy are factors that bedevil the Irish political system. Currently, the country is rules in essence by the cabinet economic core of four ministers none of whom have training in economics and finance; none of whom would be qualified to apply for a job as a financial director of a major company but all of whom want to abolish the Seanad, which if reformed could have competent people elected to such a body to the advantage of the country. In the UK, expertise in the Lords is used to address national problems and report on solutions for and against proposals and laws and hold detailed enquiries into national incidents and problems. The government wants to define abolition of a representative body as a way forward in a parliamentary system that guillotines most bills and takes its cues overwhelmingly from the permanent civil service or nods through European regulations without debate and dissection. Reply: Those politicians are elected to represent the people and the politician electorate is broader based that the TDs. So that is a populist barrel scraping denigration. Reply: This is a statement of the blindingly obvious as if it is in the current context somehow a disgrace. Reply: Well if the Taoiseach ensures a guaranteed majority to obey orders, is this point anything except predictable. How many amendments to Bills originating in the Seanad have been accepted in that period. That would give a wholly different hue to the above question and show the partiality of the comment. · This is about making sure that the Dáil which is elected by all the people is more effective. Reply: All the people do not vote and are not obliged to as in Australia for example. This attack on the Seanad will not make the Dail more effective. Less scrutiny will lessen the quality of Law enacted. This is not about making sure the Dail is more effective, it is about abolishing the Seanad. There is no guarantee that the outcome will be a more effective Dail. Reply: The parliament is elected by those who vote. Does that mean compulsory voting? We need computer screens in front of all TDs. Do we need much fewer TDs with a cabinet of advisors paid for by the public surrounding them? No we don’t, we can reform the Seanad for quality purposes. A one chamber parliament is not synonymous with ‘modernity’. · The Protection of Life and Pregnancy Bill gives provided us with an insight into how legislation will be fashioned in the new reformed Dáil. There will greater scrutiny of legislation by Committees from the outset and outside experts invited in to inform debate. Reply: Reminds me of quoting Lindi St Clair, the original Miss Whiplash. The refinition of abortion as non-abortion and the misuse of clear language to obfuscate was demonstrated many times in those debates. How were outside experts invited? Who decided ? How was the conflictiing evidence weighed? And in the end, a law about abortion used to expell dissenters via a whip with threats. Not exactly a template to demonstrate the attainment of adult autonomy through education! · There is much stronger oversight from outside Parliament than when the Seanad was originally created in the form of Ombudsman’s offices and other bodies. Reply: Abolition of the Seanad will weaken oversight. The Regulators need to be kept on their toes and the Ombudsman’s offices have complained about governments’ attitudes and actions on many occasions. The Seanad was not set up as a form of Ombudsman Service so why imply that it was? · The easy option would be to leave the Seanad in place. Reply: As if that is the only alternative. Have you heard of change and reform? A YES/NO option as the only choice. I am certain that Richard Bruton’s Belvedere, Clongowes Wood, UCD and Oxford education record precludes him from believeing this rubbish. So Richard, tell us in public that you believe this! I’d dare you. · The abolition of the Seanad would save €20 million per year. These figures have been provided by the Oireachtas Commission. Reply: So representation costs? This is a disputed €20 million. I don’t think the cost is excessive. Costs can be better contained in any reform programme. Advisors can be made generic to all senators and form a talent pool by open competition. · When the upper house is gone, people and resources can be redeployed elsewhere. Reply: How much do public enquiries cost? How much do your backroom staff members cost Mr Bruton? How well qualified are the political staff appointments? Why pay them so much? ground. That much is clear after last weekend. The child’s voice – important context point. particularly in separation, custody and contact disputes. and make false allegations against a (previously loved) target parent. way and all showed up to vote. person born on the island of Ireland to be part of the Irish nation. provision of this Constitution…” within its wording. affect any limitations placed on entitlement to citizenship.